This week we note changes to the NCL line-up, including the assignment of the Norwegian Spirit to New Orleans year-round. Princess re-introduces on board bon voyage parties, which have been gone from the scene for decades. The Ocean Liner Society chooses the Bleu de France for its 2010 cruise. 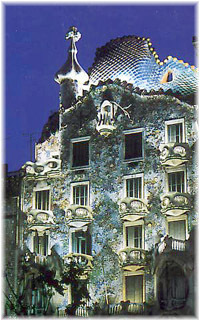 And this week's special topic is Barcelona - is it becoming the Miami of Europe? Starting in November when she finishes her 2010 Boston-Bermuda season, the Norwegian Spirit will be transferred to operating 7-day cruises out of New Orleans, every Sunday year-round. The 2,018-berth ship had once sailed year-round from New York and was well-known for the 1-night party cruises she offered between her 6-day cruises. The Spirit first started cruising from New Orleans in the winter season and has developed a following in that city. The Spirit's new itinerary will see her making calls at Costa Maya and Cozumel in Mexico, Roatan in Honduras and at Belize City. Basing the Spirit in New Orleans will double NCL's local capacity to 100,000 passengers a year and is a sign that the city is finally recovering from the trials of Katrina almost five years ago. She will join Carnival Cruise Line's 2,758-berth Carnival Triumph, which moved to New Orleans year-round in November 2009 and now sails 4-, 5- and 7-night itineraries out of the Big Easy. The Norwegian Spirit's place on this year's Boston-Bermuda circuit will be taken in 2011 by the 2,224-berth Norwegian Dawn from the New York-Boston run, which in turn will be replaced by the 2,400-berth Norwegian Jade, coming over from Europe and upgrading NCL's overall Bermuda fleet capacity by about 9 per cent. From the people who brought you the $150 bridge and engine room tour with the galley and behind the stage thrown in, we now have the $39 per person farewell party. Beginning in March, departing passengers will be able to invite friends on board as they prepare to sail on their next Princess cruise. Limited to 50 visitors per sailing, the program will only be available at certain ports. Announced on Thursday by Princess Cruises, the program, includes lunch in the main dining room and a tour of the ship, and will only be available in Los Angeles and Fort Lauderdale, starting in March, and then it will then be rolled out to New York, San Francisco and Seattle in time for the Alaska season. Security concerns will be handled by inputting visitor information to the same system that is used for passengers. This move revives an old American tradition of having guests on board on sailing, particularly in the ocean liner days in New York, but also in the early "Love Boat" days in Los Angeles. 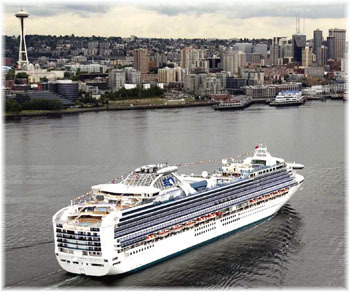 Meanwhile, another Los Angeles-based line, Crystal Cruises, has been allowing visitors on board for some time at no charge unless a meal is taken but it does not advertise its program. The Ocean Liner Society has chosen Croisières de France and its Bleu de France for its 2010 group cruise. Leaving Marseilles on Sunday 20th June, the cruise will call at Olbia, Palermo, Malta andTunisia and will make an overnight call at Ibiza before returning to Marseilles on 27th June. Built as Hapag-Lloyd Cruises' last Europa in 1981, the Bleu de France later served as SuperStar Europa and SuperStar Aries for Star Cruises and Holiday Dream for Spain's Pullmantur before becoming entering the French market for the newly-established Croisières de France in 2008. This ship has been chosen because she was one of the original cruise ship classics of the 1980s, when ship sizes were increasing. Not only that but as designed she was built for Hapag-Lloyd Cruises, and like the present Europa was in her time the top-rated cruise ship in the world. Her design is interesting as most public rooms are located aft while all her staterooms are forward in the quieter part of the ship, a trend that was once popular in German cruise ships but has not been continued as ships became larger. The Ocean Liner Society has booked group cruises on two Pullmantur ships in the past, the Oceanic and Sky Wonder and last year it cruised the Greek islands back-to-back in two pioneer cruise ships, Louis Cruises' Aquamarine (built as Royal Caribbean's Nordic Prince) and Aegean Pearl (built as NCL's Southward). Society members also managed to cruise in Phoenix Reisen's Maxim Gorkiy, the last of the German North Atlantic liners when she was built as the Hamburg, in 2008 before she was finally sold for scrapping in India. Members of the general public can qualify to travel on these cruises simply by joining the Ocean Liner Society. Membership is £20 in the UK, £23 in Europe and £25 in the rest of the world. As well as the opportunity of joining OLS group cruises, this includes a subscription to their 48-page quarterly journal, Sea Lines. Further details can be found at www.ocean-liner-society.com. The Ocean Liner Society is a focus for those primarily interested in ships that undertook line voyages, how they changed into cruising ships and the cruise liners that will take people to sea in the 21st century. It is a non-profit organisation whose members celebrate the passenger ship in its many forms. Members include employees of major shipping companies, authors, ship enthusiasts, inveterate travellers and armchair sailors. The society publishes a 48-page full colour quarterly magazine called "Sea Lines" and runs an annual "International Ship Show" as well as sponsoring monthly lectures on maritime subjects in London. Barcelona: The Miami of Europe? Royal Caribbean International followed NCL's decision to deploy its new 153,000-ton giant, the Norwegian Epic, to Barcelona in May 2011 by announcing last week that it will send its own 154,407-ton Liberty of the Seas to Barcelona in 2011. As Carnival Cruise Line's newly-delivered 130,000-ton Carnival Magic will also be there, this sets up the world's largest battle of cruise giants from the same port. But what really set tongues wagging last week was when Belén Wangüemert, managing director of Royal Caribbean Cruises in Spain, said that the Spanish market would achieve a cruise passenger growth of 60 per cent in 2010, double the 30 per cent achieved in 2009. In addition to the top three international lines, three native Spanish cruise lines operare in what, despite the state of the Spanish economy, has become the fastest-growing cruise market in Europe. Local Spanish brands include Iberocruceros, with four ships, and Pullmantur, with six, now controlled respectively by Carnival Corp & PLC and Royal Caribbean Cruise Lines. A third Spanish cruise competitor, Happy Cruises, until recently called Quail Cruises, works out of Valencia and calls on Barcelona with two smaller ships, while calls are also now spreading to Spanish ports on the Atlantic coast. This weekend, the Norwegian Epic has been out in the Bay of Biscay on her first set of sea trials, during which she was observed making speeds in excess of 24 knots. She now returns to dry dock for further work before undergoing a second set of sea trials in April. While this was happening, NCL's UK office announced that it would probably account for between 25 and 30 per cent of passengers that would board her in Barcelona in 2011, something that might not come as too much of a surprise seeing that NCL will have no ships based in the UK by then (see above). In recent years, Miami has seen about 4 million passengers a year cross its cruise docks while Barcelona, the largest embarkation port in Europe, has now exceeded 2 million, a number that is growing quickly. At the beginning and end of each respective season there are also a number of Transatlantic voyages available between the two ports, leaving Miami for Barcelona in the spring and returning from Barcelona to Miami in the autumn. But more and more, ships are not crossing but cruising from Barcelona year-round, another reason for the growth the port has seen in the passenger numbers moving over its seven cruise terminals. Barcelona now ranks fourth in the world after Miami, Port Everglades and Port Canaveral. Like Miami, one of Barcelona's main requirements is a top-grade airport to serve its port, but unlike Miami, complaints are not widespread. Spurred along by the Barcelona Olympics in 1992, Barcelona's airport has been developed so that in 2009 it handled 27 million passengers with an 83 per cent on time ratio, with a new terminal area and also now a new runway. Its airport was scored in the top ten in the world in 2009 by Flighstats. Miami, by comparison, handles about 34 million passengers. Another big difference is that while Miami airport is 14 kilometres from its port, the distance in Barcelona is just 3 kilometres. And the port has the advantage of being near to a major tourist attraction, the attractive Los Ramblas, which is within reasonable walking distance of its cruise terminals, assuming that one is not carrying baggage. With this latest news, Barcelona will definitely be the place to watch. In addition to the big three, cruise lines sailing from Barcelona also include Aida, Celebrity, Costa, Crystal, Disney, Holland America, Iberocruceros, MSC, Oceania, Princess, Pullmantur, Seabourn and Silversea.